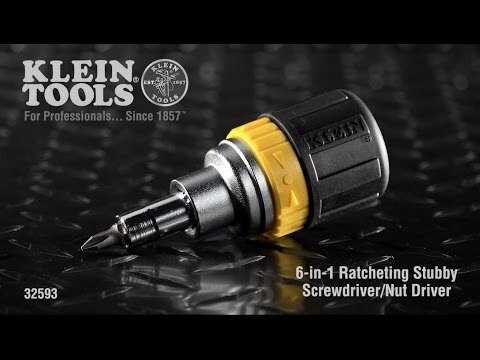 The ratcheting mechanism on this stubby screwdriver lets you work faster and with more efficiency. Includes 1/4-Inch and 5/16-Inch nut drivers. With its Cushion-Grip handle, the stubby interchangeable screwdriver/nut driver was designed with comfort and efficiency in mind. The driver is made of the highest-quality tempered steel. Its strong, durable tips are manufactured to fit screw opening securely. They resist slippage and provide positive turning action. The strong nut driver function improves bit-holding power, even with tough applications.